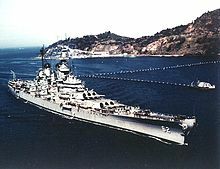 For other ships with the same name, see USS New Jersey. USS New Jersey (BB-62) ("Big J" or "Black Dragon") is an Iowa-class battleship, and was the second ship of the United States Navy to be named after the US state of New Jersey. New Jersey earned more battle stars for combat actions than the other three completed Iowa-class battleships, and was the only US battleship providing gunfire support during the Vietnam War. USS New Jersey underway in January 1985. Nickname(s): "Big J" "Black Dragon"
New Jersey was decommissioned for the last time in 1991 (after serving a total of 21 years in the active fleet), having earned a Navy Unit Commendation for service in Vietnam and 19 battle and campaign stars for combat operations during World War II, the Korean War, the Vietnam War, the Lebanese Civil War, and service in the Persian Gulf. After a brief retention in the mothball fleet, she was donated to the Home Port Alliance in Camden, New Jersey, and began her career as a museum ship 15 October 2001. New Jersey was one of the Iowa-class "fast battleship" designs planned in 1938 by the Preliminary Design Branch at the Bureau of Construction and Repair. She was launched on 7 December 1942 (the first anniversary of the attack on Pearl Harbor) and commissioned on 23 May 1943. The ship was the second of the Iowa class to be commissioned by the U.S. Navy. The ship was christened at her launching by Carolyn Edison, wife of Governor Charles Edison of New Jersey, himself a former Secretary of the Navy; and commissioned at Philadelphia 23 May 1943, Captain Carl F. Holden in command. New Jersey's main battery consisted of nine 16"/50 caliber Mark 7 guns in three three-gun turrets, which could fire 2,700-pound (1,225 kg) armor-piercing shells some 23 miles (37 km). Her secondary battery consisted of twenty 5"/38 caliber guns mounted in twin-gun dual purpose (DP) turrets, which could hit targets up to 9 miles (14 km) away. With the advent of air power and the need to gain and maintain air superiority came a need to protect the growing fleet of allied aircraft carriers, so New Jersey was fitted with an array of Oerlikon 20 mm and Bofors 40 mm anti-aircraft guns. When reactivated in 1968, New Jersey had her 20 mm and 40 mm AA guns removed and was tailored for use as a heavy bombardment ship. When reactivated in 1982, New Jersey had four twin 5"/38 caliber DP mounts removed. She was outfitted with four Phalanx CIWS mounts for protection against missiles and aircraft, and eight Armored Box Launchers and eight Quad Cell Launchers designed to fire Tomahawk missiles and Harpoon missiles, respectively. The main deck was 53,000 square feet of teak. Unlike the other Iowa-class battleships, New Jersey was named by President Franklin D. Roosevelt to repay a political debt, to then-New Jersey Governor Charles Edison. During his time in the Navy department, Edison pushed to build the Iowas, and to build one at the Philadelphia Navy Yard, which secured votes for Roosevelt in Pennsylvania and New Jersey in the 1940 presidential election. New Jersey completed fitting out and trained her initial crew in the Western Atlantic and Caribbean Sea. On 7 January 1944 she passed through the Panama Canal war-bound for Funafuti, Ellice Islands. She reported there 22 January for duty with the United States Fifth Fleet, and three days later rendezvoused with Task Group 58.2 for the assault on the Marshall Islands. New Jersey screened the aircraft carriers from Japanese attack as planes from Task Group 58.2 flew strikes against Kwajalein and Eniwetok 29 January – 2 February, softening up the latter for its invasion and supporting the troops who landed on 31 January. New Jersey began her career as a flagship 4 February in Majuro Lagoon when Admiral Raymond A. Spruance, commanding the 5th Fleet, broke his flag from her main. Her first action as a flagship was in Operation Hailstone, a two-day surface and air strike by her task force against the major Japanese fleet base on Truk in the Carolines. This attack was coordinated with the assault on Kwajalein, and effectively interdicted the Japanese naval retaliation to the conquest of the Marshalls. On 17 and 18 February, the task force accounted for two Japanese light cruisers, four destroyers, three auxiliary cruisers, two submarine tenders, two submarine chasers, an armed trawler, a plane ferry, and 23 other auxiliaries, not including small craft. New Jersey destroyed a trawler and, with other ships, sank the destroyer Maikaze. New Jersey also fired on an enemy aircraft that attacked her formation. The task force returned to the Marshalls 19 February. Between 17 March and 10 April, New Jersey first sailed with Rear Admiral Marc A. Mitscher's flagship Lexington for an air and surface bombardment of Mille, then rejoined Task Group 58.2 for a strike against shipping in the Palaus, and bombarded Woleai. Upon his return to Majuro, Admiral Spruance transferred his flag to Indianapolis. New Jersey's next war cruise, 13 April – 4 May 1944, began and ended at Majuro. She screened the carrier striking force which gave air support to the invasion of Aitape, Tanahmerah Bay and Humboldt Bay, New Guinea, 22 April, then shelled shipping and shore installations at Truk 29 April – 30 April. New Jersey and her formation shot down two enemy torpedo bombers at Truk. Her 16-inch salvos pounded Ponape 1 May, destroying fuel tanks, badly damaging the airfield, and demolishing a headquarters building. After rehearsing in the Marshalls for the invasion of the Marianas, New Jersey put to sea 6 June in the screening and bombardment group of Admiral Mitscher's Task Force. On the second day of preinvasion air strikes, 12 June, New Jersey shot down an enemy torpedo bomber, and during the next two days her heavy guns battered Saipan and Tinian, in advance of the marine landings on 15 June. The Japanese response to the Marianas operation was an order to its main surface fleet to attack and annihilate the American invasion force. Shadowing American submarines tracked the Japanese fleet into the Philippine Sea as Admiral Spruance joined his task force with Admiral Mitscher's to meet the enemy. New Jersey took station in the protective screen around the carriers on 19 June 1944 as American and Japanese pilots dueled in the Battle of the Philippine Sea. That day and the next would cripple Japanese naval aviation; in what would become known as the "Marianas Turkey Shoot", the Japanese lost some 400 planes for less than two dozen American aircraft in return. This loss of trained pilots and aircraft was equaled in disaster by the sinking of the Japanese aircraft carriers Taihō and Shōkaku by the submarines Albacore and Cavalla, respectively, and the loss of Hiyō to aircraft launched from the light aircraft carrier Belleau Wood. In addition to these losses, Allied forces succeeded in damaging two Japanese carriers and a battleship. The anti-aircraft fire of New Jersey and the other screening ships proved virtually impenetrable; two American ships were slightly damaged during the battle. Only 17 American planes were lost in combat. New Jersey's final contribution to the conquest of the Marianas was in strikes on Guam and the Palaus from which she sailed for Pearl Harbor, arriving 9 August. Here she broke the flag of Admiral William F. Halsey, Jr., 24 August, becoming flagship of the United States Third Fleet. On 30 August New Jersey set sail from Pearl Harbor, and for the next eight months was based at Ulithi to lend support to Allied forces operating in the Philippines. In this span of the Pacific War, fast carrier task forces ranged the waters off the Philippines, Okinawa, and Formosa, making repeated strikes at airfields, shipping, shore bases, and invasion beaches. In September the targets were in the Visayas and the southern Philippines, then Manila and Cavite, Panay, Negros, Leyte, and Cebu. Early in October raids to destroy enemy air power based on Okinawa and Formosa were begun in preparation for the Leyte landings of 20 October 1944. This invasion brought on the last great sortie of the Imperial Japanese Navy. Its plan for the Battle of Leyte Gulf included a feint by a northern force of planeless heavy attack carriers to draw away the battleships, cruisers and fast carriers with which Admiral Halsey was protecting the landings. This was to allow the Japanese Center Force to enter the gulf through San Bernardino Strait. At the opening of the battle planes from the carriers guarded by New Jersey struck hard at both the Japanese Southern and Center Forces, sinking a battleship 23 October. The next day Halsey shaped his course north after the decoy force had been spotted. Planes from his carriers sank four of the Japanese carriers, as well as a destroyer and a cruiser, while New Jersey steamed south at flank speed to meet the newly developed threat of the Center force. It had been turned back in a stunning defeat when she arrived. A crewman assigned to one of New Jersey's anti-aircraft guns watches helplessly as a Japanese kamikaze pilot prepares to strike Intrepid. New Jersey rejoined her fast carriers near San Bernardino 27 October 1944 for strikes on central and southern Luzon. Two days later, the force came under suicide attack. In a melee of anti-aircraft fire from the ships and combat air patrol, New Jersey shot down a plane whose pilot maneuvered it into the port gun galleries of Intrepid, while machine gun fire from Intrepid wounded three of New Jersey's men. During a similar action 25 November three Japanese planes were shot down by the combined fire of the force, part of one flaming onto the flight deck of Hancock. Intrepid was again attacked; she shot down one would-be kamikaze aircraft, but was crashed by another despite hits scored on the attacker by New Jersey gunners. New Jersey shot down a plane diving on Cabot and hit another plane which smashed into Cabot's port bow. On 18 December 1944 the ships of Task Force 38 unexpectedly found themselves in a fight for their lives when Typhoon Cobra overtook the force— seven fleet and six light carriers, eight battleships, 15 cruisers, and about 50 destroyers— during their attempt to refuel at sea. At the time the ships were operating about 300 miles (500 km) east of Luzon in the Philippine Sea. The carriers had just completed three days of heavy raids against Japanese airfields, suppressing enemy aircraft during the American amphibious operations against Mindoro in the Philippines. The task force rendezvoused with Captain Jasper T. Acuff and his fueling group 17 December with the intention of refueling all ships in the task force and replacing lost aircraft. Although the sea had been growing rougher all day, the nearby cyclonic disturbance gave relatively little warning of its approach. Each of the carriers in the Third Fleet had a weatherman aboard, and as the fleet flagship New Jersey had a highly experienced weatherman: Commander G. F. Kosco, a graduate of the aerology course at Massachusetts Institute of Technology who had also studied hurricanes in the West Indies; despite this, none of these individuals or staffs were able to give Third Fleet due warning of the impending typhoon. On 18 December, the small but violent typhoon overtook the Task Force while many of the ships were attempting to refuel. Many of the ships were caught near the center of the storm and buffeted by extreme seas and hurricane-force winds. Three destroyers—Hull, Monaghan and Spence—capsized and sank with nearly all hands, while a cruiser, five aircraft carriers, and three destroyers suffered serious damage. Approximately 790 officers and men were lost or killed, with another 80 injured. Fires occurred in three carriers when planes broke loose in their hangars, and some 146 planes on various ships were lost or damaged beyond economical repair by fires, impact damage, or by being swept overboard. As with the other battleships of TF 38, skillful seamanship brought New Jersey through the storm largely unscathed. She returned to Ulithi on Christmas Eve to be met by Fleet Admiral Chester Nimitz. Located in the center of the U.S.S. New Jersey's bridge, the Conning Tower, AKA "battle conn", contained the equipment required to "conn" the ship. This includes a ship's wheel, the ship's revolutions per minute indicator, engine telegraphs, and communications gear. A mannequin is visible in this photo. A portion of a small viewing port is visible at the back of the space. The outer shell of the Conning Tower consists of 17 inches of solid steel armor, designed to resist the impact of a 1-ton shell. The door for this entrance (not shown) weighs more than a ton. New Jersey ranged far and wide from 30 December 1944 to 25 January 1945 on her last cruise as Admiral Halsey's flagship. She guarded the carriers in their strikes on Formosa, Okinawa, and Luzon, on the coast of Indo-China, Hong Kong, Swatow and Amoy, and again on Formosa and Okinawa. At Ulithi 27 January Admiral Halsey lowered his flag in New Jersey, but it was replaced two days later by that of Rear Admiral Oscar C. Badger II commanding Battleship Division 7. In support of the assault on Iwo Jima, New Jersey screened the Essex group in air attacks on the island 19 February – 21 February, and gave the same crucial service for the first major carrier raid on Tokyo 25 February, a raid aimed specifically at aircraft production. During the next two days, Okinawa was attacked from the air by the same striking force. New Jersey was directly engaged in the conquest of Okinawa from 14 March until 16 April. As the carriers prepared for the invasion with strikes there and on Honshū, New Jersey fought off air raids, used her seaplanes to rescue downed pilots, defended the carriers from suicide planes, shooting down at least three and assisting in the destruction of others. On 24 March 1945 she again carried out the role of heavy bombardment, preparing the invasion beaches for the assault a week later. During the final months of the war, New Jersey was overhauled at Puget Sound Naval Shipyard, from which she sailed 4 July for San Pedro, Pearl Harbor, and Eniwetok bound for Guam. Here on 14 August she once again became flagship of the 5th Fleet under Admiral Spruance. Brief stays at Manila and Okinawa preceded her arrival in Tokyo Bay 17 September, where she served as flagship for the successive commanders of Naval Forces in Japanese waters until relieved 28 January 1946 by Iowa (BB-61). As part of the ongoing Operation Magic Carpet New Jersey took aboard nearly a thousand homeward-bound troops with whom she arrived at San Francisco 10 February. New Jersey photographed shortly after her 1948 decommissioning. The "igloo"-like domes on the ship were placed over her anti-aircraft guns as protection from the elements. Between 7 June and 26 August, New Jersey formed part of the first training squadron to cruise Northern European waters since the beginning of World War II. Over two thousand United States Naval Academy and NROTC midshipmen received seagoing experience under the command of Admiral Richard L. Connolly, Commander Naval Forces Eastern Atlantic and Mediterranean, who broke his flag in New Jersey at Rosyth, Scotland 23 June. She was the scene of official receptions at Oslo, where King Haakon VII of Norway inspected the crew 2 July, and at Portsmouth, England. The training fleet was westward bound 18 July for exercises in the Caribbean and Western Atlantic. After serving at New York as flagship for Rear Admiral Heber H. McLean, Commander, Battleship Division 1, 12 September – 18 October, New Jersey was inactivated at the New York Naval Shipyard. She was decommissioned at Bayonne 30 June 1948 and assigned to the New York Group, Atlantic Reserve Fleet. In 1950 North Korea invaded South Korea, prompting the United States to intervene in the name of the United Nations. President Harry S. Truman was caught off guard when the invasion struck, but quickly ordered U.S. Forces stationed in Japan into South Korea. Truman also sent U.S. based troops, tanks, fighter and bomber aircraft, and a strong naval force to Korea to support the Republic of Korea. As part of the naval mobilization New Jersey was recalled from the mothball fleet to provide seaborne artillery support for U.N. and South Korean troops. New Jersey was recommissioned at Bayonne on 21 November 1950, Captain David M. Tyree in command, and proceeded to the Caribbean, where she welded her crew into an efficient body which would meet the demanding requirements of the Korean War. She sailed from Norfolk, Virginia 16 April 1951 and arrived from Japan off the east coast of Korea 17 May. Vice Admiral Harold M. Martin, commanding the United States Seventh Fleet, placed his flag in New Jersey for the next six months. New Jersey's guns opened the first shore bombardment of her Korean career at Wonsan 20 May. During her two tours of duty in Korean waters, she was again and again to play the part of seaborne mobile artillery. In direct support to United Nations troops; or in preparation for ground actions, in interdicting Communist supply and communication routes, or in destroying supplies and troop positions, New Jersey used her 16-inch guns to fire far beyond the capacity of land artillery, moved rapidly and free from major attack from one target to another, and at the same time could be immediately available to guard aircraft carriers should they require her protection. It was on this first such mission at Wonsan that she received her only combat casualties of the Korean War. One of her men was killed and two severely wounded when she took a hit from a shore battery on her number one turret and received a near miss aft to port. New Jersey opening fire upon North Korean targets near the 38th parallel. Between 23 and 27 May and again 30 May 1951, New Jersey pounded targets near Yangyang and Kansong, dispersing troop concentrations, dropping a bridge span, and destroying three large ammunition dumps. Air spotters reported Yangyang abandoned at the end of this action, while railroad facilities and vehicles were smashed at Kansong. On 24 May, she lost one of her helicopters after the crew pushed their chopper to the limit of its fuel searching for a downed aviator. The helicopter crew was able to reach friendly territory and were later returned to their ship. With Admiral Arthur W. Radford, Commander in Chief Pacific Fleet, and Vice Admiral C. Turner Joy, Commander Naval Forces Far East aboard, New Jersey bombarded targets at Wonsan 4 June. At Kansong two days later she fired her main battery at an artillery regiment and truck encampment, with 7th Fleet aircraft spotting targets and reporting successes. On 28 July off Wonsan the battleship was again taken under fire by shore batteries. Several near misses splashed to port, but New Jersey's precision fire silenced the enemy and destroyed several gun emplacements. New Jersey sailed to the aid of troops of the Republic of Korea once more 17 August, returning to the Kansong area where for four days she provided harassing fire by night, and broke up counterattacks by day, inflicting a heavy toll on enemy troops. She returned to this general area yet again 29 August, when she fired in an amphibious demonstration staged behind enemy lines to ease pressure on the Republic of Korea's troops. The next day she started a three-day saturation of the Changjon area, with one of her own helicopters spotting the results: four buildings destroyed, road junctions smashed, railroad marshaling yards afire, tracks cut and uprooted, coal stocks scattered, and many buildings and warehouses set blazing. Aside from a brief break in firing 23 September to take aboard wounded from the Korean frigate Apnok (PF-62), damaged by gunfire, New Jersey was heavily engaged in bombarding the Kansong area, supporting the movement of the U.S. X Corps. The pattern again was harassing fire by night, destruction of known targets by day. Enemy movement was restricted by the fire of her big guns. A bridge, a dam, several gun emplacements, mortar positions, pillboxes, bunkers, and two ammunition dumps were demolished. On 1 October 1951, General Omar Bradley, Chairman of the Joint Chiefs of Staff, and General Matthew B. Ridgeway, Commander in Chief Far East, came on board to confer with Admiral Martin. Between 1 and 6 October New Jersey was in action daily at Kansong, Hamhung, Hungnam, Tanchon, and Songjin. Enemy bunkers and supply concentrations provided the majority of the targets at Kansong; at the others New Jersey fired on railroads, tunnels, bridges, an oil refinery, trains, and shore batteries. She also engaged an enemy gun emplacement with her five-inch (127 mm) gun mounts, which New Jersey successfully destroyed. The Kojo area was her target 16 October as she sailed in company with HMS Belfast, pilots from HMAS Sydney spotting. The operation was well-planned and coordinated, and excellent results were obtained. Another highly satisfactory day was 16 October, when the spotter over the Kansong area reported "beautiful shooting every shot on target-most beautiful shooting I have seen in five years." This five-hour bombardment leveled ten artillery positions, and in smashing trenches and bunkers inflicted some 500 enemy casualties. New Jersey dashed up the North Korean coast raiding transportation facilities from 1 to 6 November. She struck at bridges, road, and rail installations at Wonsan, Hungnam, Tanchon, Iowon, Songjin, and Chongjin, leaving four bridges destroyed, others badly damaged, two marshaling yards badly torn up, and many feet of track destroyed. With renewed attacks on Kansong and near the Chang-San-Got Peninsula 11 and 13 November, New Jersey completed her first tour of duty in Korea. Relieved as flagship by Wisconsin, New Jersey cleared Yokosuka for Hawaii, Long Beach and the Panama Canal, and returned to Norfolk 20 December for a six-month overhaul. Between 19 July 1952 and 5 September, she sailed as flagship for Rear Admiral H. R. Thurber, who commanded the NROTC midshipman training cruise to Cherbourg, Lisbon, and the Caribbean. Now New Jersey prepared and trained for her second Korean tour, for which she sailed from Norfolk 5 March 1953. Shaping her course via the Panama Canal, Long Beach, and Hawaii, New Jersey reached Yokosuka 5 April, and next day relieved Missouri as flagship of Vice Admiral Joseph H. Clark, Commander 7th Fleet. On 12 April New Jersey returned to action by shelling Chongjin; in seven minutes she scored seven direct hits, blowing away half the main communications building there. At Pusan two days later, New Jersey manned her rails to welcome the President of the Republic of Korea and Madame Rhee, and American Ambassador Ellis O. Briggs. New Jersey fired on coastal batteries and buildings at Kojo 16 April; on railway track and tunnels near Hungnam 18 April; and on gun emplacements around Wonsan Harbor 20 April, silencing them in five areas after she had herself taken several near misses. Songjin provided targets 23 April. Here New Jersey scored six direct 16 inch (406 mm) hits on a railroad tunnel and knocked out two rail bridges. New Jersey provided artillery support for a major air and surface strike on Wonsan 1 May, as 7th Fleet planes both attacked the enemy and spotted for the battleship. She knocked out eleven Communist shore guns that day, and four days later destroyed the key observation post on the island of Hodo Pando, commanding the harbor. Two days later Kalmagak at Wonsan was her target. New Jersey's tenth birthday, 23 May 1953, was celebrated at Incheon with President and Madame Rhee, Lieutenant General Maxwell D. Taylor, and other dignitaries on board. Two days later New Jersey returned to action along the west coast at Chinampo to knock out harbor defense positions. New Jersey fires a six gun salvo of 16 in shells into an enemy troop concentration near Kaesong, Korea. 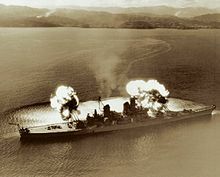 The battleship was under fire at Wonsan 27 May – 29 May, but her five-inch (127 mm) guns silenced the counter-fire, and her 16-inch shells destroyed five gun emplacements and four gun caves. She also hit a target that flamed spectacularly: either a fuel storage area or an ammunition dump. New Jersey returned to the key task of direct support to troops at Kosong 7 June. On her first mission, she completely destroyed two gun positions, an observation post, and their supporting trenches, then stood by on call for further aid. She then sailed back to Wonsan for a day-long bombardment 24 June, aimed at guns placed in caves. The results were excellent, with eight direct hits on three caves, one cave demolished, and four others closed. Next day she returned to troop support at Kosong, her assignment until 10 July, aside from necessary withdrawal for replenishment. At Wonsan 11 July – 12 July, New Jersey fired one of the most concentrated bombardments of her Korean duty. For nine hours the first day, and for seven the second, her guns opened fire on gun positions and bunkers on Hodo Pando and the mainland with telling effect. At least ten enemy guns were destroyed, many damaged, and a number of caves and tunnels sealed. New Jersey smashed radar control positions and bridges at Kojo 13 July, and was once more on the east coast bombline 22 July – 24 July to support South Korean troops near Kosong. These days found her gunners at their most accurate: A large cave, housing an important enemy observation post was closed, the end of a month-long United Nations effort, and a great many bunkers, artillery areas, observation posts, trenches, tanks and other weapons were destroyed. At sunrise on 25 July 1953 New Jersey was off the key port, rail and communications center of Hungnam, pounding coastal guns, bridges, a factory area, and oil storage tanks. She sailed north that afternoon, firing at rail lines and railroad tunnels as she made for Tanchon, where she launched a whaleboat in an attempt to spot a train known to run nightly along the coast. Her big guns were trained on two tunnels between which she hoped to catch the train, but in the darkness she could not see the results of her six-gun salvo. New Jersey's mission at Wonsan, the next day, was her last. Here she destroyed large-caliber guns, bunkers, caves and trenches. Two days later, she learned of the truce. Her crew celebrated during a seven-day visit at Hong Kong, where she anchored 20 August. Operations around Japan and off Formosa were carried out for the remainder of her tour, which was highlighted by a visit to Pusan. Here president Rhee came aboard on 16 September to present the Korean Presidential Unit Citation to the 7th Fleet. Relieved as flagship at Yokosuka by Wisconsin 14 October, New Jersey was homeward bound the next day, reaching Norfolk on 14 November. During the next two summers she crossed the Atlantic with midshipmen on board for training, and during the rest of the year sharpened her skills with exercises and training maneuvers along the Atlantic coast and in the Caribbean. New Jersey stood out of Norfolk 7 September 1955 for her first tour of duty with the United States Sixth Fleet in the Mediterranean. Her ports of call included Gibraltar, Valencia, Cannes, Istanbul, Souda Bay; and Barcelona. She returned to Norfolk 7 January 1956 for the spring program of training operations. That summer she again carried midshipmen to Northern Europe for training, bringing them home to Annapolis 31 July. New Jersey sailed for Europe once more 27 August as flagship of Vice Admiral Charles Wellborn, Jr., Commander United States Second Fleet. She called at Lisbon, participated in NATO exercises off Scotland, and paid an official visit to Norway where Crown Prince Olav was a guest. She returned to Norfolk 15 October, and 14 December arrived at New York Naval Shipyard for inactivation. She was decommissioned and placed in reserve at Bayonne 21 August 1957. Due to heavy loss rates of U.S. aircraft (commencing with Operation Rolling Thunder in 1965), studies were conducted on ways of alleviating those air losses while at the same time delivering the ordnance payloads required by the escalation of the war. On 31 May 1967 the Secretary of Defense Robert McNamara authorized a study aimed at determining what would be required to get New Jersey reactivated in her present condition, and when the results of the submitted study proved favorable toward the reactivation he took action. In August 1967 the Secretary of Defense made the decision to recommission a battleship "for employment in the Pacific Fleet to augment the naval gunfire support force in Southeast Asia". New Jersey was selected for this task because she was in better material condition than her sisters, having received an extensive overhaul prior to decommissioning. Upon her reactivation she underwent a period of modernization during which the 20 mm and 40 mm anti-aircraft guns on the battleship were removed, and she received improved electronic warfare systems and improvements to her radar. Armed as such New Jersey was formally recommissioned 6 April 1968 at the Philadelphia Naval Shipyard, Captain J. Edward Snyder in command. During sea trials following her modernization, New Jersey set the battleship world speed record by achieving a speed of 35.2 knots (62.5 kph/40.5 mph), maintaining this speed for six hours. New Jersey, then the world's only active battleship, departed Philadelphia 16 May, calling at Norfolk and transiting the Panama Canal 4 June before arriving at her new home port of Long Beach, California, 11 June. Further training off Southern California followed. On 24 July New Jersey received 16 inch shells and powder tanks from Mount Katmai by conventional highline transfer and by helicopter lift, the first time heavy battleship ammunition had been transferred by helicopter at sea (now known as vertical replenishment). New Jersey off Oahu in September 1968, prior to departure on her first WESTPAC cruise following recommissioning for service in Vietnam. Departing Long Beach 2 September, New Jersey touched at Pearl Harbor and Subic Bay before sailing 25 September for her first tour on the gun line along the Vietnamese coast. Near the 17th parallel on 30 September, the battleship fired her first shots in battle in over sixteen years, expending a total of 29 sixteen inch rounds against People's Army of Vietnam (PAVN) targets in and near the Demilitarized Zone (DMZ) at the 17th parallel. New Jersey took up station off Tiger Island 1 October and fired at targets north of the DMZ before moving south that afternoon to engage Viet Cong targets. She accounted for six bunkers, a supply truck and an anti-aircraft site that day; additionally, she helped rescue the crew of a Marine spotting plane forced down at sea by anti-aircraft fire. On 3 October New Jersey fired on targets south of Tiger Island, and on 4 October the battleship fired on a Communist troop concentration and destroyed several bunkers. On the evening of 7 October New Jersey received reports that a number of waterborne logistics craft were moving south near the mouth of the Song Giang River. New Jersey responded by closing on the formation, and succeeded in sinking eleven of the craft before they could beach. On 11 October New Jersey engaged a coastal installation with her guns; however, she shifted her fire when a recon plane spotting for the battleship reported an enemy truck concentration north of Nha Ky. New Jersey gunners quickly retrained the battleship's big guns and managed to inflict heavy damage on six of the vehicles. Early on the morning of 12 October New Jersey trained her guns in anticipation of shelling the heavily fortified and well protected Vinh caves. For the next three days New Jersey pounded the area with her 16 in shells in an effort to eliminate the Viet Cong presence in the region. 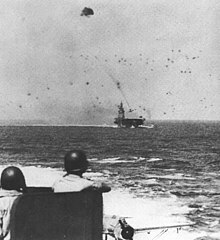 Aided by spotter aircraft from the aircraft carrier USS America, New Jersey engaged enemy targets, setting several enemy positions on fire and sealing one cave. On 14 October New Jersey shifted her gunfire to the coastal artillery sites on Hon Matt Island, destroying one battery on the island. On 16 October New Jersey took up station in support of the U.S. 3rd Marine Division. Using both the 16 in and 5 in guns New Jersey engaged and destroyed 13 structures and an artillery site, in the process halting an enemy platoon moving through the DMZ. New Jersey continued to lend firepower support on the 17th until departing to lend her gunfire to the First Field Force. Foul weather prevented spotter aircraft from flying until 20 October; however, New Jersey quickly made up for lost time on the gun line by destroying a Viet Cong command post and nine bunkers in support of the 173rd Airborne Brigade, who were operating about 50 miles (80 km) north of Nha Trang. The next day New Jersey maneuvered into the waters of the Baie de Van Fong to fire at Viet Cong command posts, but poor visibility of the target area prevented any damage estimates. Upon completion of this mission New Jersey steamed south, taking a position off Da Nang and Point DeDe to lend naval gunfire support to the U.S. 1st Marine Division operating in the area. On 2 November New Jersey commenced firing operations against nine positions, but the heavy foliage in the area prevented spotters from seeing the results of the shelling. On 4 November New Jersey received orders to reinforce southern II Corps near Phan Thiết; she arrived on station later that night. The next day she answered eight call for fire support missions from the 173rd Airborne Brigade, in the process destroying eight Viet Cong bunkers and five structures. On 11 November New Jersey departed Vietnamese waters to replenish; she returned to the gunline 23 November and relieved USS Galveston, taking up position in support of the U.S. Army's Americal Division. That afternoon New Jersey's 5 inch guns shelled enemy buildings, destroying 15 structures and inflicted heavy damage on 29 others. On 25 November New Jersey launched the most destructive shore bombardment of her Vietnam tour. 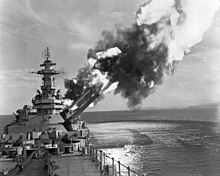 For the next two days the battleship concentrated her fire at Viet Cong storage areas near Quảng Ngãi, destroying 182 structures and 54 bunkers, inflicting heavy damage to 93 structures, and demolishing several tunnel complexes before departing for Point Betsy near Hue 27 November to support the 101st Airborne Division. Between 2 and 8 December New Jersey returned to aid the 3rd Marine Division, shelling Viet Cong bunker complexes for the Marines operating around the Da Nang area before departing for Singapore 9 December. On 26 December New Jersey returned to the gunline, taking up station off Tuy Hòa in support of the Army of the Republic of Vietnam 47th Regiment. For the next three days New Jersey fired her guns to support the II Corps, in the process destroying Viet Cong bunkers and supply depots and neutralizing enemy cave posts. New Jersey would remain in the waters of the DMZ until after New Years, shelling Communist bunkers for ground troops until leaving to support the 1st Marine Division 3 January. USS New Jersey bombarding positions during the Vietnam War. Throughout January and into February New Jersey operated in support of the Marines. On 10 February the battleship left to reinforce the Korean 2nd Marine Brigade operating near Da Nang. The battleship's target was a suspected subterranean staging area for a Viet Cong regiment. New Jersey's big guns went to work on the complex, firing 16 inch shells into tunnels and bunkers to aid the ground troops. On 14 February the battleship steamed south of the DMZ to provide support for the 3rd Marine Division, in the process destroying an anti-aircraft site with her big guns. The next day New Jersey fired on an enemy rocket site northeast of Con Thien, destroying the facility, then trained her guns on known Communist positions to harass PAVN forces. On 22 February New Jersey responded to an urgent request for fire support from the besieged Oceanview observation post near the DMZ. For the next six hours New Jersey fired her guns, ultimately repelling the attacking force. For the remainder of February and into March New Jersey shelled targets along the DMZ. On 13 March the battleship departed the gunline bound for Subic Bay. She returned to action on 20 March, operating near Cam Ranh Bay in support of the Korean 9th Infantry Division. For the next week New Jersey patrolled the waters between Phan Thiet and Tuy Hoa, shelling targets of opportunity along the coast. On 28 March New Jersey took up station south of the DMZ to aid the 3rd Marine Division, remaining there until 1 April, whereupon New Jersey departed for Japan. During the battleship's tour of duty along the gunline in Vietnam, New Jersey had fired 5,688 rounds of 16 inch shells, and 14,891 rounds of 5-inch shells. New Jersey and Missouri moored at the Naval Inactive Ship Maintenance Facility at Puget Sound Naval Shipyard in 1981. Note the difference between the modernized New Jersey and the nearly-unmodified Missouri. As the crisis eased, New Jersey was released to continue her interrupted voyage. She anchored at Long Beach 5 May 1969, her first visit to her home port in eight months. Through the summer months, New Jersey's crew toiled to make her ready for another deployment, and deficiencies discovered on the gun line were remedied. According to official reports, though, reasons of economy were to dictate otherwise: on 22 August 1969 the United States Secretary of Defense released a list of names of ships to be inactivated; at the top of the list was New Jersey. Five days later, Captain Snyder was relieved of command by Captain Robert C. Peniston. Assuming command of a ship already earmarked for the "mothball fleet", Captain Peniston and his crew prepared for their task. New Jersey got underway on the voyage 6 September, departing Long Beach for Puget Sound Naval Shipyard. She arrived on the 8th, and began preinactivation overhaul to ready herself for decommissioning. On 17 December 1969 New Jersey's colors were hauled down and she entered the inactive fleet, following the words of her last commanding officer: "Rest well, yet sleep lightly; and hear the call, if again sounded, to provide fire power for freedom." A Tomahawk cruise missile protrudes from an All-Up-Round (AUR) canister. Four canisters are contained in a Mark 143 Armored Box Launcher, which protected the missiles from damage prior to launch. This photo shows two of the eight box launchers carried by the U.S.S. New Jersey, one horizontal and one elevated. Photo taken after the U.S.S. New Jersey was converted to a museum ship. As part of president Ronald Reagan's and Navy Secretary John Lehman's effort to create a 600-ship Navy, New Jersey was selected for reactivation in the spring of 1981, and she was towed from Puget Sound Naval Shipyard to Long Beach Naval Shipyard at the end of July 1981 for modernization/reactivation. At the time of the reactivation the Navy envisioned using New Jersey and her sister ship Iowa to meet sustained global requirements and relieve the strain on the Navy created by an increase in U.S. commitments to the Indian Ocean and Caribbean Sea regions. 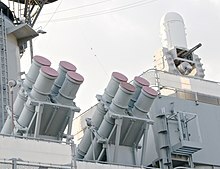 During this time the Navy developed several proposals to update their battleships to carry cruise missiles and anti-ship missiles, as well as point defense system mounts. Preliminary modernizations schemes included the removal of four of the ten 5 inch gun mounts on New Jersey to make room for the armored box launchers that would be required to carry and launch the BGM-109 Tomahawk missiles. At one point the NATO Sea Sparrow was to be installed on the reactivated battleships; however, it was determined that the system could not withstand the overpressure effects when firing the main battery. President Ronald Reagan speaks during the recommissioning ceremony for New Jersey. On 28 December 1982 New Jersey was formally recommissioned at Long Beach, California, her new homeport. The recommissioning of New Jersey marked a return of the world's last battleships after a 13-year absence from the world's oceans. New Jersey's modernization was unique in that she was to be the only reactivated Iowa-class battleship to lose a gun turret. At the time the Navy made the announcement plans were underway to remove New Jersey's No. 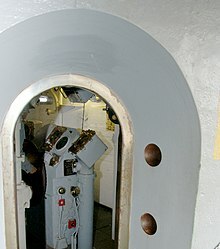 3 16 in gun turret (located aft of the superstructure). In its place the Navy planned to install one of two systems: a vertical launching missile magazine which would have enabled New Jersey to carry an additional 48 Tomahawk or Harpoon missiles, or using the space generated by a removed gun turret for aircraft related updates centering on VTOL or V/STOL type aircraft. These ideas were ultimately dropped, and New Jersey retained her No. 3 gun turret during her 1980s career. 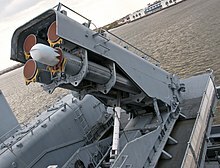 Harpoon Missiles and Phalanx Close-In Weapons System on the U.S.S. New Jersey. Each of the eight tubes on the left would hold a RGM-84 Harpoon Anti-Ship Missile. The weapon in the upper right is one of four Phalanx Close-In Weapons Systems on the ship. These were used to defend against missiles and aircraft that were within a mile of the ship. The white dome contained radars and controls. The gun is a 20mm Gatling gun that would fire 3000 rounds/minute. Over the next several months the ship was upgraded with the most advanced weaponry available; among the new weapons systems installed were four MK 141 quad cell launchers for 16 AGM-84 Harpoon anti-ship missiles, eight Armored Box Launcher (ABL) mounts for 32 BGM-109 Tomahawk missiles, and a quartet of the United States Navy's Phalanx Close in Weapon System (CIWS) Gatling guns for defense against enemy anti-ship missiles and enemy aircraft. New Jersey also received eight RQ-2 Pioneer Unmanned Aerial Vehicles, which are remotely controlled drones that replaced the helicopters previously used to spot for her nine 16"/50 Mark 7 guns. Also included in her modernization were upgrades to radar and fire control systems for her guns and missiles, and improved electronic warfare capabilities. Because New Jersey had been recalled for service in the Vietnam War her modernization differed from her sisters for a number of reasons. When reactivated in 1967 New Jersey had her 20 mm Oerlikon and 40 mm Bofors anti-aircraft guns removed, and received improved electronic warfare capabilities. This alteration helped reduce the time it took get New Jersey recommissioned: since she was not in her World War II format the only major physical alteration to New Jersey involved the removal of four of her ten 5 inch gun mounts to make room for the Armored Box Launchers. In addition to saving time, this also made New Jersey cheaper to reactivate since the cost needed to modernize the battleship only included the addition of missile and gun system mounts, electronic warfare suites, and improved radar and gun spotter technology. Since the Tomahawk missile system had not yet been adopted for use during New Jersey's original update the Navy announced plans to divert assets from two of their Spruance-class destroyers to install the necessary Tomahawk launchers. Similarly, assets were diverted from two Farragut-class guided missile destroyers to allow for the installation of Harpoon launchers on New Jersey. On 18 April 1983 a van carrying a 2,000 pound load of explosives, slammed into the U.S. embassy in West Beirut, killing 63. In August 1983, Israel withdrew its Defense Forces from the Chouf District (southeast of Beirut), thus removing the buffer between the Druze and the Christian militias and triggering another round of brutal fighting. In August 1983 militiamen began to bombard United States Marines positions near Beirut International Airport with mortar and rocket fire as the Lebanese Army fought Druze and Shia forces in the southern suburbs of Beirut. On 29 August 1983, two Marines were killed and fourteen wounded, and in the ensuing months the Marines came under almost daily attack from artillery, mortar, rocket, and small-arms fire. After this attack the Marines began returning fire. The Reagan Administration decided to dispatch New Jersey, a decision the Marines cheered. New Jersey opens fire on an enemy position off the coast of Beirut 9 January 1984. On 16 September 1983 Druze forces massed on the threshold of Suk El Gharb, a village defended by the Lebanese Army. Suk El Gharb was a village with strategic importance: the militias coming up from the south had to traverse Suk El Gharb to get to the Beirut–Aley road. Moreover, Suk El Gharb controlled a ridge that overlooked Baabda, Yarze, which was the location of the Ministry of Defence, and East Beirut. From that ridge, the Militia gunners could shoot directly downhill at those locations with artillery. United States Navy warships shelled Druze positions and helped the Lebanese Army hold the town of Suk El Gharb until a cease-fire was declared on 25 September, on which day the battleship New Jersey arrived on the scene. The arrival of New Jersey was one of several factors contributing to a reduction in the number of attacks on the Marines. On 28 November—after 23 October 1983 Beirut barracks bombing—the U.S. government announced that New Jersey would be retained off Beirut although her crew would be rotated. On 14 December, New Jersey fired 11 projectiles from her 16-inch (406 mm) guns at hostile positions inland of Beirut. These were the first 16-inch (406 mm) shells fired for effect anywhere in the world since New Jersey ended her time on the gunline in Vietnam in 1969. This shelling was in response to attacks on U.S. reconnaissance planes by Syrian/Druze antiaircraft batteries. Entertainers during a Christmas Eve USO show in 1983 on board the USS New Jersey (BB-62) off the coast of Beirut, Lebanon. (left to right) Miss USA Julie Hayek, Cathy Lee Crosby, Bob Hope, Ann Jillian and Brooke Shields. Carrying on a tradition he had begun in World War II of spending Christmas with U.S. forces overseas, Bob Hope and his troupe of entertainers gave a show on board the New Jersey on 24 December 1983. Four hundred Marines stationed in Beirut attended the show. On 8 February 1984, New Jersey fired almost 300 shells at Druze and Shi'ite positions in the hills overlooking Beirut. Some 30 of these massive projectiles rained down on a Syrian command post in the Bekaa Valley east of Beirut, killing the general commanding Syrian forces in Lebanon and several other senior officers. This was the heaviest shore bombardment since the Korean War. Although New Jersey performed her job expertly during the intervention in Lebanon some have criticized the decision to have New Jersey shell Druze and Syrian forces. Members of this camp allege that this action forced a shift in the previously neutral U.S. forces by convincing local Lebanese Muslims that the United States had taken the Christian side; New Jersey's shells had killed hundreds of people, mostly Shiites and Druze. In his memoir, General Colin Powell (at the time an assistant to Caspar Weinberger) noted that "When the shells started falling on the Shiites, they assumed the American ‘referee’ had taken sides." The accuracy of New Jersey's guns was also called into question. An investigation into New Jersey's gunfire effectiveness in Lebanon, led by Marine Colonel Don Price, found that many of the ship's shells had missed their targets by as much as 10,000 yards (9,140 m) and therefore may have inadvertently killed civilians. Tim McNulty, a correspondent for the Chicago Tribune based in Lebanon said, "Everybody loved the New Jersey until she fired her guns. Once she fired, it was obvious she couldn't hit anything." The inaccuracy is believed to have resulted because the ship's main gunpowder had been remixed by the Navy, under the direction of Captain Joseph Dominick Miceli at the Naval Weapons Support Center, and rebagged. Powder lots (an individual production of powder) burn at different rates. Therefore, remixing the powder lots could cause the guns to fire inconsistently. The problem was apparently resolved after the Navy was able to locate additional powder supplies which had not been remixed. In 1986 New Jersey began her next deployment, this time operating as part of the Pacific Fleet and as the centerpiece of her own battle group. This was first time that New Jersey had operational control of her own group of escorts since the Korean War, and she cruised from Hawaii to Thailand in 1986, freeing up U.S. aircraft carriers for other missions and in the process becoming the only major U.S. naval presence in the region from May to October. Although in command of her own Battleship Battlegroup New Jersey did sail with the aircraft carriers USS Ranger (CV-61) and USS Constellation (CV-64) and USS Thach (FFG-43) while deployed in 1986. According to a declassified command history for the nuclear-armed battleship New Jersey, during her transit through the Sea of Okhotsk on 27–28 September 1986, "close passes" were made by Soviet Bear and Badger bombers, a Hormone helicopter, and a May maritime patrol airplane. A Kara-class cruiser and two Grisha III frigates also shadowed the U.S. ships. The maneuver, according to the command history, "marked the first time a U.S. battleship had operated in the Soviet Navy's backyard." Following an overhaul at Long Beach which lasted into 1988 New Jersey returned to the Pacific Ocean, this time operating as part of a surface action group. The battleship operated near the coast of Korea prior to the opening of the 1988 Summer Olympics in Seoul, South Korea, then departed for Australia to participate in the Australian bicentennial celebrations. In April 1989, as New Jersey was preparing for her last operational cruise, sister ship Iowa suffered a catastrophic explosion in her No. 2 gun turret; fallout from the incident led U.S. Naval officials to freeze live fire exercises with the guns until the investigation into the explosion was concluded. Eventually, the ban was lifted and New Jersey was allowed to use her big guns again. New Jersey's final cruise began in 1989 as part of Pacific Exercise '89. Upon completion of the exercise, New Jersey sailed through the Indian Ocean and into the Persian Gulf, in the process becoming the centerpiece for various battle groups and surface action groups. New Jersey remained in the Persian Gulf for the rest of the year, returning to the United States in February 1990. With the collapse of the Soviet Union in the early 1990s and the lack of a perceived threat against the United States came drastic cuts to the defense budget, and the high cost of maintaining battleships as part of the active fleet became uneconomical; as a result, New Jersey was decommissioned for the final time at Naval Station Long Beach, California, on 8 February 1991, with the ship serving a total of 21 years (the most of the four Iowa's) in active service. The decision to decommission New Jersey robbed the battleship of the chance to participate in Operation Desert Storm in 1991, a military campaign to forcibly remove Iraqi invasion troops from Kuwait. Hostilities had commenced on or about 15 January 1991 and sister ships Missouri and Wisconsin were engaging Iraqi targets with Tomahawk missiles at the time of New Jersey's decommissioning. Following her decommissioning New Jersey was towed to Bremerton, Washington, where she remained in reserve until struck from the Naval Vessel Register in January 1995. 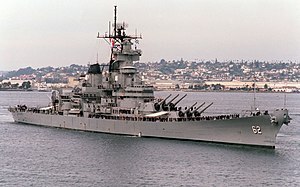 Section 1011 of the National Defense Authorization Act of 1996 required the United States Navy to reinstate to the Naval Vessel Register two of the Iowa-class battleships that had been struck by the Navy in 1995; these ships were to be maintained in the United States Navy reserve fleets (or "mothball fleet"). The Navy was to ensure that both of the reinstated battleships were in good condition and could be reactivated for use in the Marine Corps' amphibious operations. Due to Iowa's damaged Turret 2 the Navy selected New Jersey for placement into the mothball fleet, even though the training mechanisms on New Jersey's 16-in guns had been welded down. The cost to fix New Jersey was considered less than the cost to fix Iowa; as a result, New Jersey and Wisconsin were reinstated to the Naval Vessel Register and placed back in the reserve fleet. View of the deck of New Jersey at her berth in Camden. The battleship was donated to the Home Port Alliance of Camden, New Jersey, for use as a museum ship. The New Jersey at her berth in Camden at night, Sept 2010. New Jersey remained in mothball fleet until the Strom Thurmond National Defense Authorization Act of 1999 passed through the United States Congress 18 October 1998. Section 1011 required the United States Secretary of the Navy to list and maintain Iowa and Wisconsin on the Naval Vessel Register, while Section 1012 required the Secretary of the Navy to strike New Jersey from the Naval Vessel Register and transfer the battleship to a not-for-profit entity in accordance with section 7306 of Title 10, United States Code. Section 1012 also required the transferee to locate the battleship in the State of New Jersey. The Navy made the switch in January 1999, and on 12 September, New Jersey was towed by the tug Sea Victory from Bremerton, Washington to Philadelphia, for restoration work in the Philadelphia Naval Shipyard in advance of her planned donation for use as a museum. Two competing requests for the battleships were filed, one by the USS New Jersey Battleship Commission of Bayonne, New Jersey, and one by the Home Port Alliance of Camden, New Jersey. Both teams submitted plans to operate and maintain the battleship as a museum. After a review of both plans, the Navy selected the Home Port Alliance as the battleship's final resting place. Secretary of the Navy Richard Danzig made the announcement on 20 January 2000, and on 15 October of that year New Jersey arrived at her final resting place on the Camden Waterfront. Shortly after her arrival New Jersey was opened to the public, officially beginning her new career as a museum ship with the name Battleship New Jersey Museum and Memorial. Self-guided tours, guided group tours, and overnight encampments are offered on the floating museum. Overnight encampments, typically for the benefit of Scouting organizations, offer the opportunity to sleep and eat in the original berths and mess decks. New Jersey has been placed on several historic registers. In 1997, while the ship was still in the mothball fleet, the New Jersey State Review Board for Historic Sites recommended that it "be listed in the New Jersey Register of Historic Places, contingent upon the transfer of the battleship to New Jersey waters." In 2004, the State of New Jersey officially designated the battleship as an historical place. This cleared New Jersey for placement on the National Register of Historic Places, a list to which New Jersey was officially added in 2004. In early 2012 there was debate on whether or not the USS New Jersey should be moved to Liberty State Park. Ultimately, nothing came from the debate and the ship remains in Camden. New Jersey earned nine battle stars for her World War II service, four for the Korean War, two for the Vietnam War, and four for action in Lebanon and the Persian Gulf region.Among other awards, she received the Navy Unit Commendation for Vietnam service, the Presidential Unit Citation from the Republic of the Philippines, and the Presidential Unit Citation from the Republic of Korea. Based on these New Jersey holds the distinction of being the most decorated battleship in US history. ^ a b "An Act providing for the issuance of Battleship U.S.S. New Jersey license plates ..." (PDF). NJ state library. 12 September 1995. ^ "Battleship New Jersey: Frequently Asked Questions". Battleship New Jersey. Battleship New Jersey Museum and Memorial. 28 October 2014. Archived from the original on 29 October 2014. Retrieved 27 October 2014. ^ Ruch, Walter (8 December 1942). "Dreadnought Tops 26 Ship Launches". The New York Times. p. 1. ^ "Naval Vessel Register". United States Navy. Retrieved 16 March 2007. ^ a b c d e f g h i j k l m n o p q r s t u v w x y z aa ab ac ad ae af ag ah ai aj ak al am an ao ap aq ar as at au "USS New Jersey (BB 62) History". Dictionary of American Naval Fighting Ships. United States Navy. Retrieved 16 March 2007. ^ Johnston, Ian & McAuley, Rob (2002). The Battleships. London: Channel 4 Books (an imprint of Pan Macmillan, LTD). p. 120. ISBN 0-7522-6188-6. ^ Willard, Jack (3 November 2016). "Own a Piece of History!". Battleship New Jersey. Retrieved 27 December 2018. ^ Comegno, Carol. "Historian details the role politics played in battleship's creation", Courier-Post, 6 January 2000. Retrieved 27 May 2007. ^ William F. Halsey held the rank of a four star Admiral throughout the Second World War. In December 1945, four months after the official surrender of the Japanese, he was promoted to the rank of Fleet Admiral and awarded his fifth star. "Fleet Admiral William Frederick Halsey, Jr". Naval Historical Center. 2 June 1996. Archived from the original on 7 December 2006. Retrieved 8 June 2007. ^ a b "Typhoons and Hurricanes: Pacific Typhoon, 18 December 1944". Department of the Navy – Navy Historical Center. 10 April 2001. Archived from the original on 3 January 2009. Retrieved 8 January 2006. ^ a b c Samuel Eliot Morison. "Third Fleet in Typhoon Cobra, December 1944". History of US Naval Operations in World War II. Dave James' homepage. Archived from the original on 18 October 2005. Retrieved 8 January 2006. ^ Frick, Martin P. (1991). "The Big Guns: America's Century Long Romance with the Battleship". In Lightbody, Andy; Blaine, Taylor (eds.). Battleships at War: America's Century Long Romance with the Big Guns of the Fleet. Canoga Park, CA: Challenge Publications, Inc. pp. 64, 65, 86–89. ^ a b c d e f g h i j k l "Narrative 1968 History of USS New Jersey (BB-62)". USS New Jersey Veteran's, INC. Retrieved 26 May 2005. ^ a b "1969 Narrative History of USS New Jersey (BB-62)". USS New Jersey Veteran's, INC. Retrieved 31 May 2005. 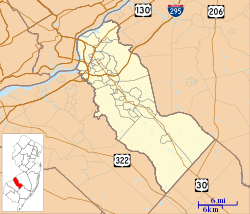 ^ Persistent rumors have suggested that the real reason that New Jersey was decommissioned had to do with the Paris Peace Talks, some source suggest that the Vietnamese would not meet with U.S. representatives unless New Jersey was removed from the gunline, other sources suggest that the Vietnamese offered to meet with representatives of the United States if New Jersey was returned to the states. No compelling evidence exists to support or refute these claims. ^ "New Jersey starts new life". The Bulletin. (Bend, Oregon). UPI. 27 July 1981. p. A1. ^ a b c d e "Update of the Issues Concerning the Proposed Reactivation of the Iowa class battleships and the Aircraft Carrier Oriskany" (PDF). United States General Accounting Office. 20 April 1981. pp. 3–18. Retrieved 25 May 2005. ^ At the time New Jersey was scheduled to undergo modernization the Tomahawk missile system had not yet been introduced for use in the field; however, the Navy announced plans to include the updates that would be needed for New Jersey to use the Tomahawk system while undergoing her modernization. "Update of the Issues Concerning the Proposed Reactivation of the Iowa Class Battleships and the Aircraft Carrier Oriskany" (PDF). United States General Accounting Office. 20 April 1981. Retrieved 8 June 2007. ^ Statement by Admiral Rowden in the Department of Defense Appropriations for Fiscal Year 1982. 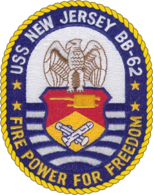 ^ New Jersey decommissioned in 1969, then was the first to be recommissioned under the 600-ship Navy program. 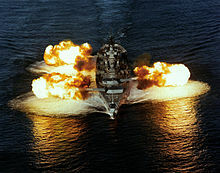 "USS New Jersey (BB 62)". navysite.de. Retrieved 27 May 2005. ^ a b c d e "BB-61 IOWA-class (Specifications)". Federation of American Scientists. Retrieved 26 November 2006. ^ Holland, W. J. (2004). The Navy. China: Barnes & Noble, Inc., by arrangement with Hugh Lauter Levin Associates, Inc. p. 184. ISBN 0-7607-6218-X. ^ "Aircraft: RQ-2 Pioneer". The Warfighter's Encyclopedia. Archived from the original on 15 July 2007. Retrieved 8 June 2007. ^ By comparison Iowa, Missouri, and Wisconsin had to be stripped of their 20 mm Oerlikon and 40 mm Bofors anti-aircraft guns, in addition to the removal of four of their ten 5 in guns. ^ The estimated cost of reactivating New Jersey with her gun turrets intact was ,26 million, vs the estimated ,92 million to reactivate Iowa. "Update of the Issues Concerning the Proposed Reactivation of the Iowa Class Battleships and the Aircraft Carrier Oriskany" (PDF). United States General Accounting Office. 20 April 1981. Retrieved 8 June 2007. ^ Levins, Hoag (18 October 2001). "Launch your own missile from Battleship New Jersey: Warship Museum Prepares New 'Interactive' Combat Control Center". HistoricCamdenCounty.com. Retrieved 21 May 2007. ^ a b c "The Lebanese War, Lebanese Civil War (subsection:The Israeli Defense Forces Withdrawal and the Mountain War)". cederland.org. Archived from the original on 23 May 2007. Retrieved 25 May 2007. ^ Roberto Suro; Kenneth W. Banta (26 September 1983). "Listening for That Whistle". Time Magazine. Retrieved 9 October 2008. ^ a b Frank, Benis M. (1987). U.S. Marines in Lebanon 1982–1984 (PDF). History and Museums Division, Marine Corps. p. 127. LCCN 87-619851. Library of Congress Card No. 87-619851. Archived from the original (PDF) on 12 August 2014. ^ a b "USS New Jersey (BB 62)". navysite.de. Retrieved 27 May 2005. ^ Barry Hillenbrand, William E. Smith and Dean Brelis (26 December 1983). "Familiar Fingerprints". Time Magazine. Retrieved 5 October 2008. ^ "At Sea/Lebanon: USS New Jersey Shells Beirut Hills/Amal Fighters Take Over West Beirut". ITN. Reuters. 8 February 1984. ^ a b Nicholas Blanford (4 March 2008). "U.S. warship stirs Lebanese fear of war". Christian Science Monitor. ^ U.S. Library of Congress. "Lebanon – United States". Retrieved 25 May 2007. ^ Glass, Charles (July 2006). "Lebanon Agonistes". CounterPunch. Archived from the original on 5 January 2009. Retrieved 17 October 2009. ^ Thompson II, Charles C. (1999). A Glimpse of Hell: The Explosion on the USS Iowa and Its Cover-Up. W. W. Norton. p. 140. ISBN 0-393-04714-8. ^ Bonner, Kit; Bonner, Carolyn; Bonner, Kermit (19 November 1998). Great Naval Disasters: U.S. Naval Accidents in the 20th Century. Zenith Press. p. 57. ISBN 0-7603-0594-3. ^ Thompson, p. 140, 165. Miceli later led the technical investigation into the USS Iowa turret explosion in spite of the presumable conflict of interest with finding fault with powder that had been mixed and bagged under his direction. Richard Milligan, captain of New Jersey in February 1984, led the first investigation into the Iowa explosion and whose findings were subsequently discredited and discarded. ^ a b c d Mooney, James L. "History of the USS New Jersey, BB-62". Dictionary of American Naval Fighting Ships, Vol. V. United States Navy. pp. 60–63. Retrieved 1 June 2007. ^ "Nuclear Notebook". Bulletin of the Atomic Scientists. 5 (7): 63. September 1988. Retrieved 26 December 2011. ^ a b "National Defense Authorization Act for fiscal year 1996 (Subtitle B-Naval Vessels and Shipyards)" (PDF). National Institute of Standards and Technology. 10 February 1996. p. 422. Retrieved 26 May 2005. ^ "Strom Thurmond National Defense Authorization Act of 1999 (Subtitle B-Naval Vessels and Shipyards)" (PDF). 105th Congress, United States Senate and House of Representatives. pp. 200–201. Archived from the original (PDF) on 20 June 2007. Retrieved 12 March 2007. ^ "Battleship New Jersey". Battleship New Jersey Museum and Memorial. Archived from the original on 19 March 2016. Retrieved 26 May 2005. ^ "SECNAV announces the Battleship New Jersey donation" (Press release). Office of Assistant Secretary of Defense (Public Affairs). 20 January 2000. Retrieved 26 May 2005. ^ a b "USS New Jersey Veterans Inc". USS New Jersey Veterans, Inc. Retrieved 26 May 2005. ^ "Visit". Battleship New Jersey. Retrieved 10 November 2012. ^ "Overnights". Battleship New Jersey. Retrieved 10 November 2012. ^ Dorothy P. Guzzo, Deputy State Historic Preservation Officer (9 July 1997). "Letter to the USS New Jersey Battleship Commission". State of New Jersey, Department of Environmental Protection, Division of Parks and Forestry, Historic Preservation Office. Archived from the original on 3 March 2012. 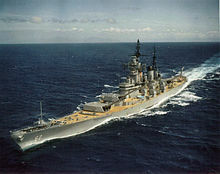 On March 26, 1997, The New Jersey State Review Board for Historic Sites favorably recommended that the Battleship U.S.S. 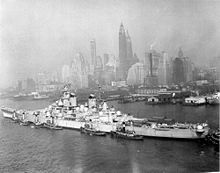 New Jersey be listed in the New Jersey Register of Historic Places, contingent upon the transfer of the battleship to New Jersey waters from its current location in Washington State. Once the transfer is complete, the Historic Preservation Office will expedite processing of the application for Registration. ^ "Historic Preservation Bulletin" (PDF). The New Jersey Department of Environmental Protection: Historic Preservation Office. 2004. p. 3. Retrieved 26 May 2005. ^ Colimore, Edward (12 March 2012). "A new battle looms for USS New Jersey". The Navy Times. Associated Press. ^ "Battle Record of the USS New Jersey". USS New Jersey Veterans, Inc. Retrieved 19 April 2015. Adamson, Hans Christian, and George Francis Kosco. Halsey's Typhoons: A Firsthand Account of How Two Typhoons, More Powerful than the Japanese, Dealt Death and Destruction to Admiral Halsey's Third Fleet. New York: Crown Publishers, 1967. Calhoun, C. Raymond. Typhoon, The Other Enemy: The Third Fleet and the Pacific Storm of December 1944. ©1981.